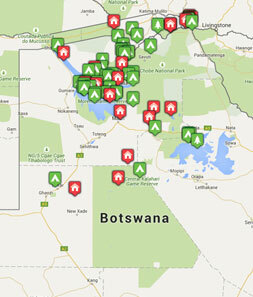 Tribes Overall: "Amazing trip with excellent game viewing and wonderful lodges. No problems with transfers, pick-ups etc. In our view perfect time to visit both countries in terms of climate, water level on Falls and in Delta etc." Guides: "Very impressed with the level of knowledge of the local guides and drivers, some going beyond of call of duty trying to find us that elusive leopard - we succeeded eventually!" Wonderful tented camp with excellent food and choice of activities. Intimate and close to wildlife (elephants in camp overnight). Lovely areas for eating and relaxing. Fabulous location again very close to wildlife. A little 'over the top' in terms of size of accommodation and not completely in keeping with the bush environment. Needs to provide sun shade on decking areas outside accommodation. Food excellent. Guides amazing (Mugadi and Aaron), tracking prides of lions with us. Our favourite - very remote, very intimate and so close to wildlife. Pride of lions outside tent, elephants and hippos in spitting distance in marshes in front of lodge. Excellent guiding (Isaac). Relaxing two days at end of trip as no game drives necessary. Lovely rustic tented camp, again with excellent food and amazing river views - great bucket shower! Loved the 'hide', spent 3 hours in there watching zebra, elephants etc etc. Great time sitting around fire in the evenings. Could be disappointing if not mixed with more remote camps due fencing of farming areas etc. Pure luxury in paradise, very romantic - did not want to leave. Definitely needs a minimum of 3 nights as otherwise there is insufficient time to enjoy the lodge. Upgrade to dog house at far end of lodge area, amazing architecture and style. Fabulous personal service, great views of river, surrounded by wildlife. Trip to Livingstone Island a real adventure - standing and swimming a couple of metres away from the falls not for the faint hearted.